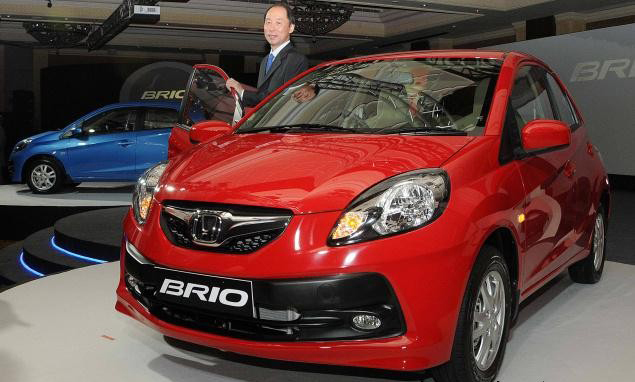 Honda leading manufacturer of premium cars in India, today announced new 6 variants - EMT, EXMT, SMT, VMT, VXMT and VXAT of Honda Brio with some feature upgrades to make the car more convenient, comfortable and pleasurable to drive for its customers. The upgrades variants include a Driver Seat Height Adjuster to enhance the overall driving comfort and a Rear Windshield Defogger as an additional safety feature. Both these features were found to be amongst the most desirable features in the Brio based on the customer’s feedback. Coming new variants of Honda Brio with a 4-cylinder 1.2-litre i-VTEC engine that delivers maximum output of 88 PS @ 6000 rpm and Torque of 109 Nm @ 4500 rpm while giving too good fuel economy of 19.4 km/ l for Manual Transmission and 16.5 km/l for Automatic Transmission. (For Metallic color additional Rs. 3,500). Indians required a compact,stylish,fully featured low cost car and Brio has all these qualities.And this is the reason that it has performed well in its segment which is famous for cut-throat competition.